This Gunma-Prefecture based machinery company does not just sell machines but it also sells dreams. SAKAKIBARA KIKAI designs, manufactures, and sells environmental preservation machines, and they also make fun robots as a part of its employee education. For example, LAND WALKER, a one-person mecha robot with two legs and weapons is one of their creations they really proud of. Doesn’t it just look like a robot in Science Fiction anime? It’s got a cockpit and two air guns. It may not practical but entertaining! Actually, it is showed at some events and got a lot of “wow” from audiences. 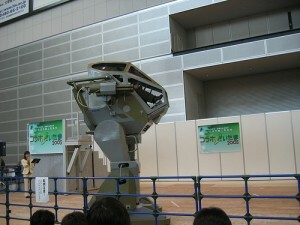 They also made a mini version of one-person mecha robot for a child. They offer 4 to 12 year-old children for pilot experience. 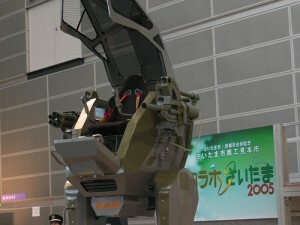 The lucky children can enjoy the mecha like the boy in this video. According to the company’s website(link below), their next project is this punching robot. It is simple looking compare to the LAND WALKER but still looks fun. It is going to be a cool festival (fair) game!